We added Sew Iconic by Liz Gregory and published by A & C Black Bloomsbury Publishing when it came out in 2012. A student wanted to replicate the Kiera Knightley emerald green dress from Atonement and this seemed like a good fit for both that and getting into adapting pattern blocks by grading, so off we went. From Marilyn Monroe’s billowy white halter in The Seven Year Itch to Audrey Hepburn’s effortlessly chic black number in Breakfast at Tiffany’s, the silver screen’s stunning dresses have always left stylish women enchanted. But no matter how many trips they’ve taken to the mall or even to designer boutiques, it’s still always been nearly impossible to find those dream dresses. But now, with Sew Iconic, they can finally have the show-stopping outfits they’ve always wanted! 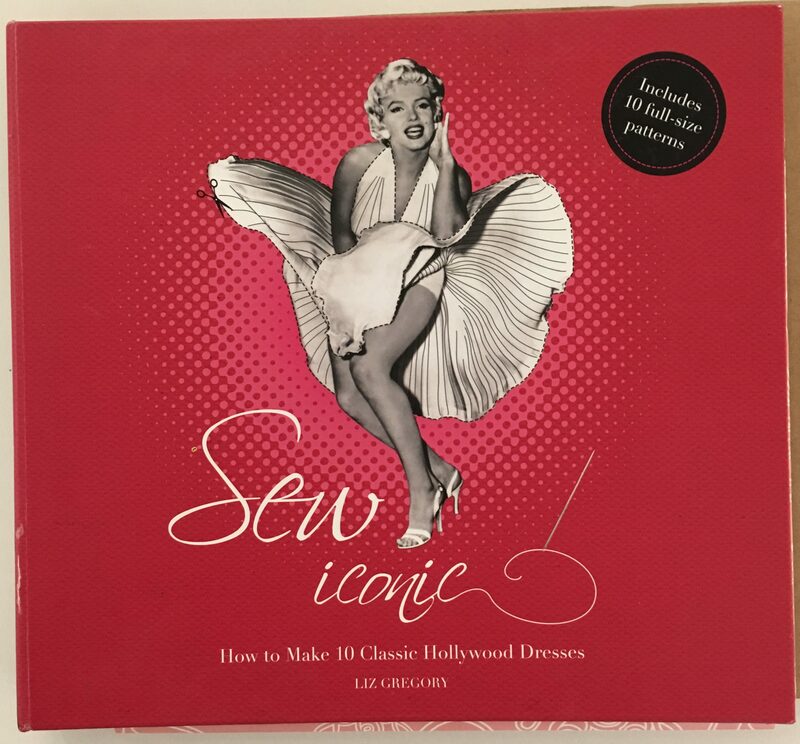 This amazing guide includes sewing patterns, tips on materials, and clear instructions for making the dresses of Grace Kelly, Rita Hayworth, Kate Winslet, and many more iconic actresses. Beautiful photographs throughout show the full skirts and fun tops in all their glory and are paired with stories of the clothes, the designers, and the films — all timeless classics. We start off with a basic introduction and how the book works. In its tone it is very similar to “The Little Black Dress” by Simon Henry in that it is a project-based book that focuses on adapting blocks or core pattern pieces to turn them into variations of famous dresses. Patterns overlaid on 3 sheets of AO paper. 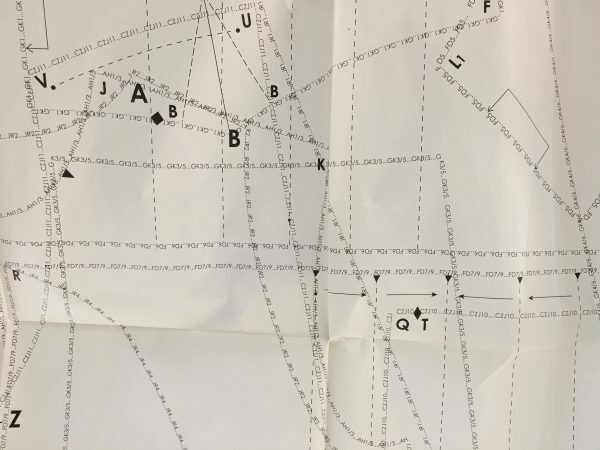 Gregory walks us through some basic sewing information with regards to tools and supplies and then dives into reading the overprinted 3 pages of pattern pieces. If you have sewn a Burda patten from the Burda Style Magazine or anything by Patrones magazine, you will know exactly how to deal with this. If you haven’t before, then pay close attention. It will make sense, but you will have to focus while you hunt for the right line to trace. Once they have walked you through finding and tracing the correct pattern pieces, they then go into adjusting the one-size block by grading it to your size and making specific adjustments. A note to the beginner or intermediate student ho has never worked with pattern before: You may want to have a manual or two on grading and fitting as a helper with this. The instructions are fine, but they are not overly developed. You will need help if you haven’t done this before unless you are one of those sewists who just “gets” everything right off the bat. 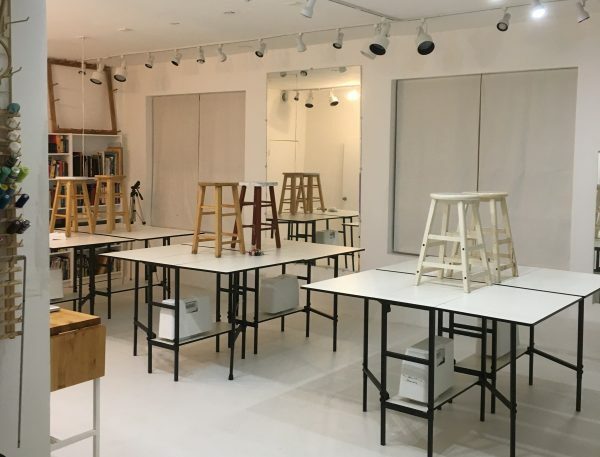 If you aren’t, then read up a little on pattern making, grading, and fitting. These projects should all have slopers made unless you are a really competent sewist. Seriously. There are separate subsections here on techniques for seaming, sewing, supplies, and fabric selection that will seem like afterthoughts to the average sewist but will seem too light and breezy to someone who doesn’t have a lot of sewing experience yet – this is the way of the world for books like this. If you are a beginner through intermediate sewist you will definitely want to have some ancillary information handy so that you don’t get overwhelmed. If you are an intermediate to advanced sewist you can just dove right in to the patterns themselves and go to town. Brown & White polka dot dress from Pretty Woman: A simple trapeze-cut flared dress drawn in at the waist by a matching tie wrap belt. This is probably the most straightforward of all the cuts and because of this, the easiest. 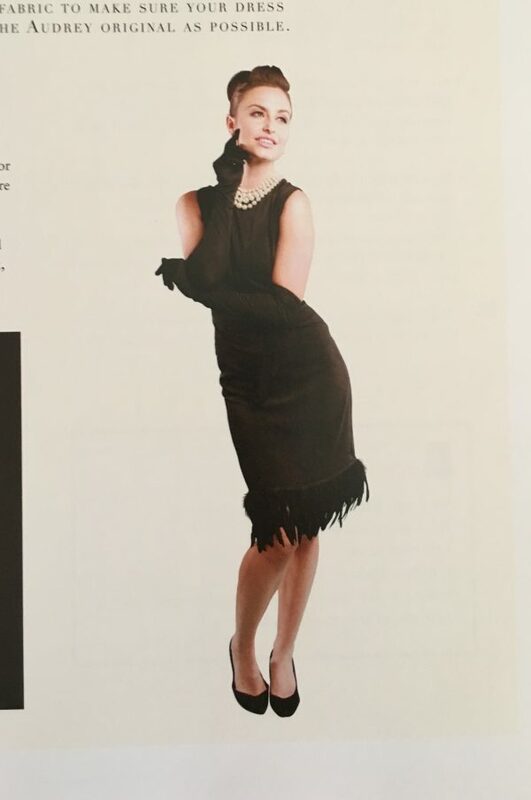 Audrey Hepburn’s little black dress from Breakfast at Tiffany’s: A straight sheath dress that has the suggested addition of feather trim around the hem – simple to make, simple to fit, but needs just the right fabric to make it look like something you want to wear and keep it from being boring. Splurge on the fabric. 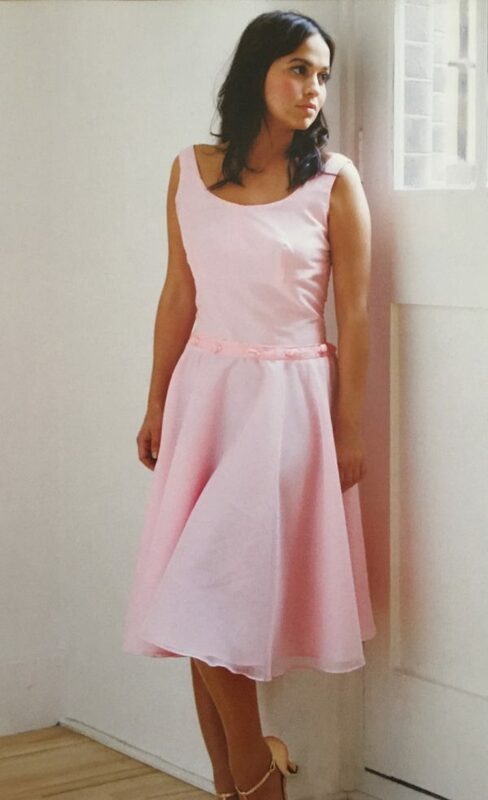 Pink Mambo Dress from Dirty Dancing: This pattern has been pared down from the original so that the waistline detail is all but gone. It is a simple bodice and circle skirt that has a slightly dropped waist. If you want to duplicate the original, you are going to have to add in a separate waistband or make a wider belt with floral waist appliqués. Marilyn Monroe’s Seven Year Itch Subway Grate Dress: This isn’t a hard dress to get right – it is so iconic that you can just suggest it with some white polyester chiffon or you can go whole hog and use a silk georgette or jersey. The pattern here is a straightforward halter with a pleated circle skirt – you may want to look into buying pleated yardage or see about having yardage pleated professionally if you want the real look. It is not a fun thing to do this much pleating without the proper equipment as a home sewist. 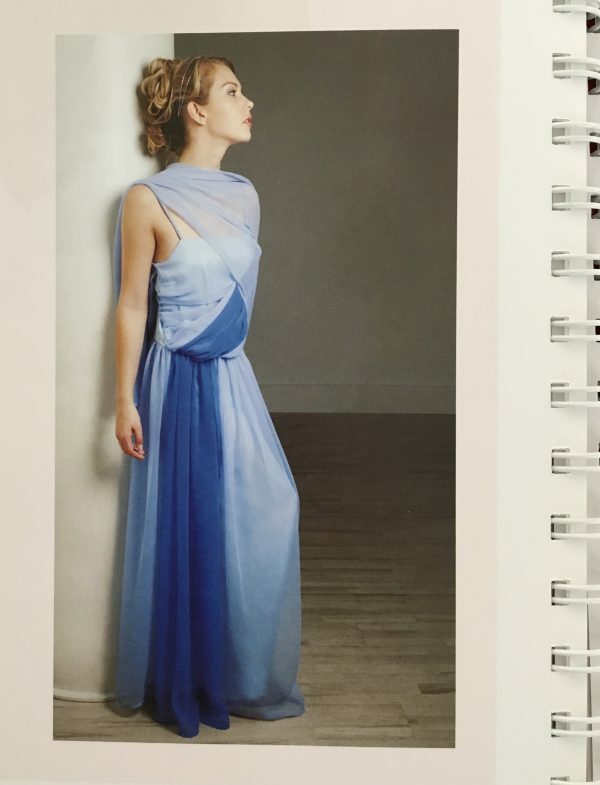 Keira Knightley’s green silk evening gown from Atonement: This is the pattern that our student used and this dress is, in our opinion, one of the truest in terms of fit, drape, and look out of the entire book. 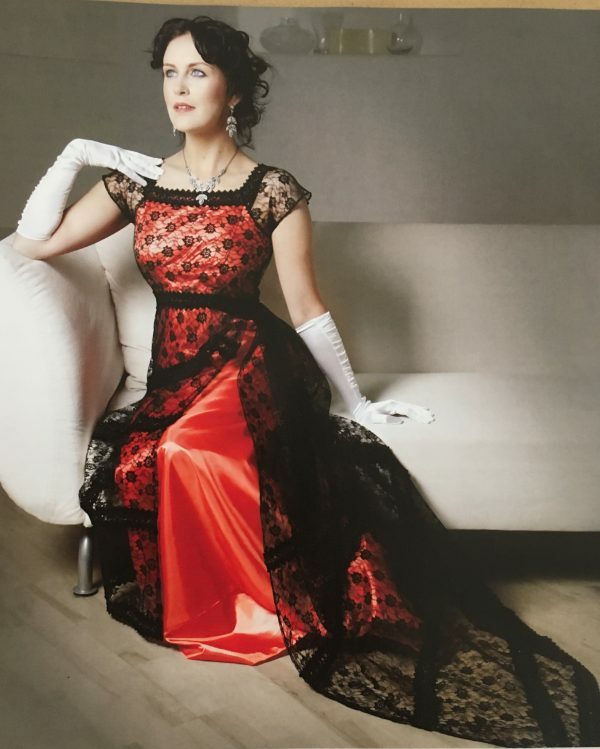 You have to make sure that you use a fabric that has the right drape and collapses on itself a bit like a charmeuse or it will just look like wrapped rags, but that is the nature of dresses like this. The pattern itself is deceptively simple, but like a Halston from 1973 it gives you shape in the way that the fabric is tied and then moves. Don’t be deceived when you see 4 simple pattern pieces – you have to be able to see how to drape and tie it to get it right. Black Showgirl Dress worn by Catherine Zeta Jones in Chicago the musical: This is an interpretation of a flapper dress for a stage musical. It is probably the most complicated cut of all of them in the book – beginner sewists should steer clear of this little guy unless they are going for full-on interpreted flapper costume. The shape is great and there is nothing wrong with the pattern pieces, but it will be hard for anyone below intermediate level to get right and have it look like anything other than a Hallowe’en costume. 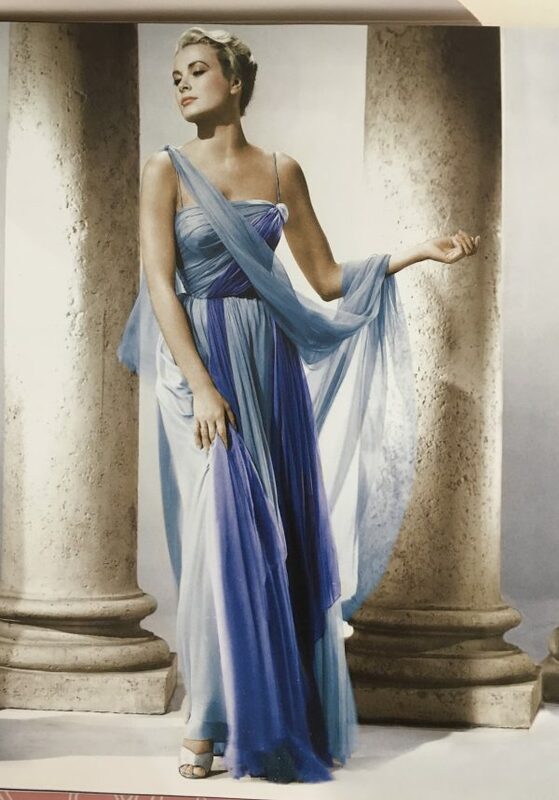 Grace Kelly’s Blue Chiffon Draped Gown from To Catch A Thief: This is a great pattern in and of itself, but only whispers in the direction of the original. In the original dress, the chiffon layers are built on and drape from a pretty formidable foundation. This gives them a sense of anchorage and calculated substance. The recreation does not rely on this and, though it is a fine pattern and dress in and of itself, is not particularly similar to the original. This is the most disappointing dress in the series for us, but only as it relates to the original – the dress itself is fine. Rita Hayworth’s Black Sheath from Gilda: This dress is very true to the inspiration – it has a foundation built in and the lines of the dress are just a knockout. If you want a strapless sheath column, you could not go farr wrong to start here. On these guys you have to get the fit perfect, so pay attention to what you are doing. Unlike #5 in this list, you can’t rely on the drape of beautiful fabric to save you if you botch the fit. Faye Dunaway’s Fawn Cachmere Coat from The Thomas Crown Affair: The shape is ok, but the fabric needs to be right if you are going for this one. We felt like it was unfortunate that they show the recreation in silk dupioni satin rather than a cashmere or wool suiting. This needs to look smooth and unbroken so that the button details and simplicity of the cut really shine. You want matte fabric and perhaps an underlined suiting or something – not something that has the reflection of silk. It ends up looking less Thomas Crown and more “poor-man’s cheongsam” which isn’t great. Keep the fabric selection closer to the original and you will be fine and can focus on all those fabric covered buttons. 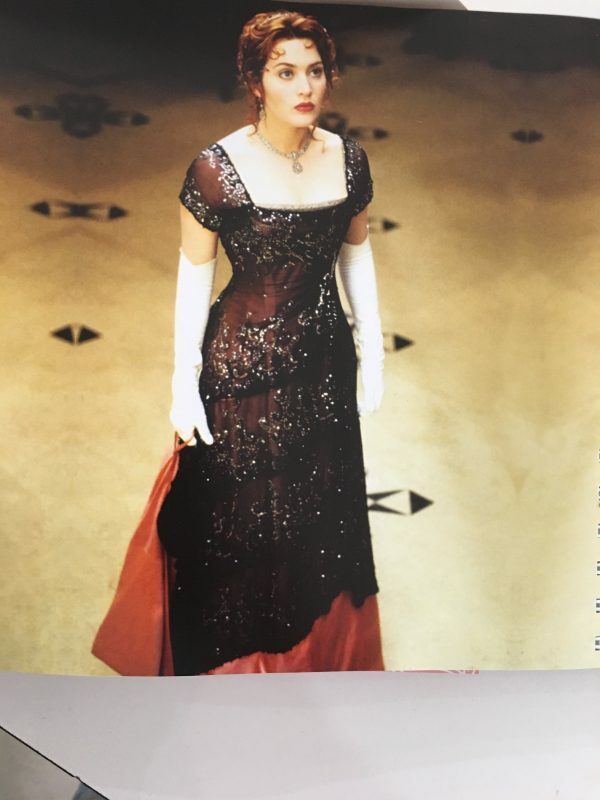 And we round it out with Kate Winslet’s Titanic dress from the dinner scene: This is a satin dress with a lace overlay – Gregory gives you a really nice simplified version of this dress and then tells you why. These dresses from this era are so involved and so time consuming that to try to duplicate it would take all your time and money for a good 6 months as a home sewist. 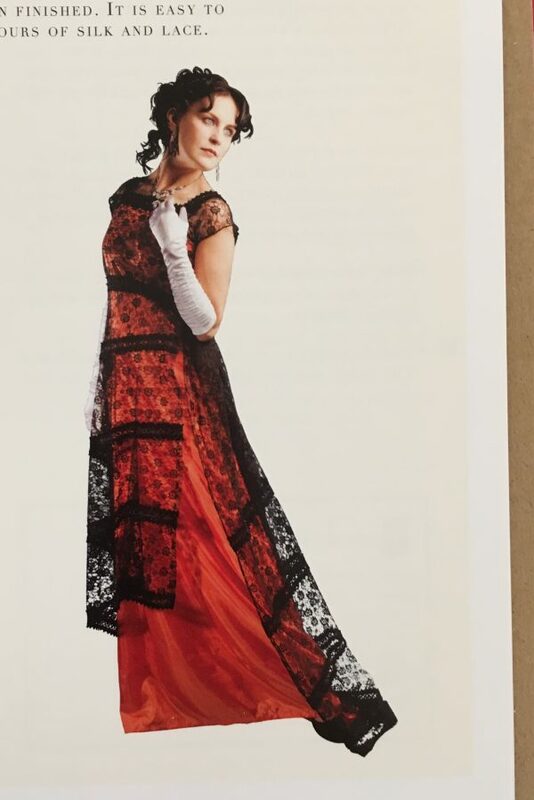 This version would either be a good inspiration for something close to late Edwardian costuming or would be a fine dress for a Hallowe’en party (even if you are 20 years late to the Titanic party). But a good introduction to the shape of dresses like this. In terms of piecing and construction, this is probably the most complicated dress in the book as far as sewing, fitting, piecing, and pattern shapes go. Totally doable, but it will take a while to parse. The book ends with a basic glossary and index, but the average sewist is probably going to want to have a couple of things on hand to make sure they don’t miss anything. A fitting manual, a grading manual, and a basic comprehensive sewing manual will be your best friends with these kind of project based books if you are a beginner to intermediate sewist. If you are wanting to start working outside of big-4 or smaller independent pattern companies and want to really feel around through this part of the sewing world, this is a great little book to try out. Just be aware that your success is going to be heavily weighted toward your drafting and grading skills rather than outright sewing skills. 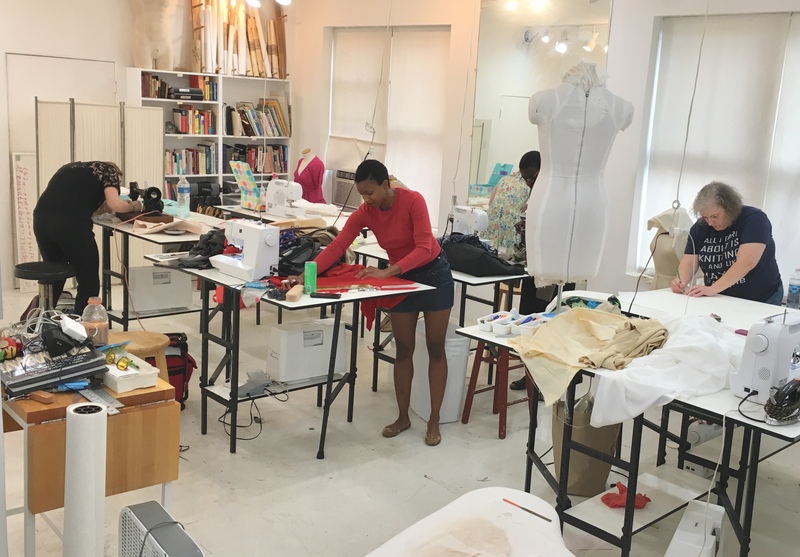 You can buy Sew Iconic Here. It ranges from US$23 – US$60 on Amazon and pops up frequently in second hand stores – just make sure that it has the pattern sheets included in the envelope mounted to the inside front cover unless you already have some drafting skills and a sloper or block.